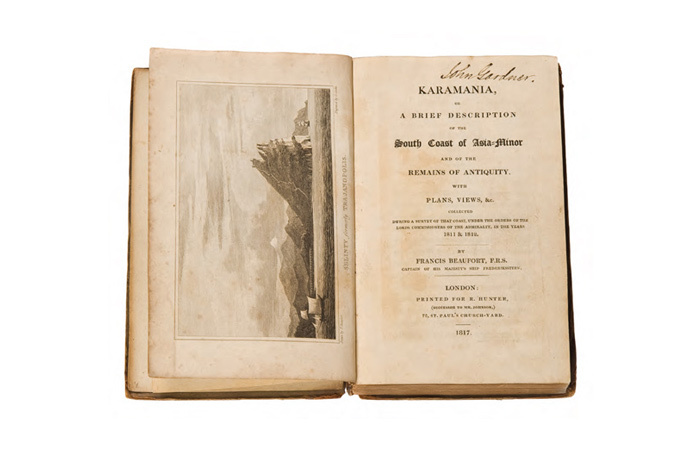 A/ Francis Beaufort, Karmania, or a brief description of the south coast of Asia - Minor and of the remais of antiquity. With plans, views, & c. Collected during a survey of that coast,under the orders of the lords commisioners of admiralty, in the years 1811 & 1812. London, R. Hunter, 1817, x, , 299 s.; 5 levha; 1 katlanır harita. Döneminin yorgun cildinde. B/ Two months in Palestine: or, a guide to a rapid journey to the chief places of interest in the Holy Land. London, Nisbet and Co., 1870, 236 s.;  levha. Yayıncısının orijinal cildinde. C/ Hen. Maundrell, A Journey from Aleppo to Jerusalem at Easter, A.D. 1697. The fourth edition, to which is now added an account of the author’s journey to the banks of Euphrates at Beer, and to the country of Mesopotamia. Oxford, Printed at the Theater, MDCCXXI , , 145, , 10 s.,  planş. Döneminin yorgun cildinde.